On Proximity addresses the ‪affects and politics of forms of closeness and distance in a variety of cultural practices. Prompted by the pervasiveness of performance strategies declaring themselves immersive or participatory, and the fascination with connectivity evident in contemporary curatorial discourse, the issue puts critical pressure on binaries such as passivity/activity, consumption/production, and freedom/control by attending to the plurality of relational positions that are created through cultural practice. 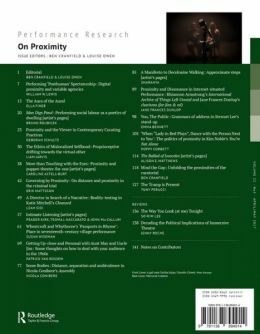 The articles in this issue explore how a range of forms and modes of proximity are made manifest in art, theatre and performance in different social and historical contexts. From the dramaturgy of psychosis and the curating of fictional lives, to online intimacies, the social praxis of song, and contemporary political cultures, On Proximity is itself an exercise in exploring the potentialities of bringing diverse subjects, objects and disciplines into closer relation.